Updated: After three special elections in Texas where In El Paso, Democrat Art Fierro won the special election to replace former state Rep. Joe Pickett (HD-79), in Houston, Democrat Christina Morales won the especial election held by ex-state Rep. Carol Alvarado (HD-145) and In San Antonio Democrat Ray Lopez won the special election to replaced Rep. Justin Rodriguez (HD-125) Hispanic representation in Texas and California show that though Texas is Republican state where Hispanic are more conservative, Hispanics are electing more Democrat to almost the same numbers as in California, or higher. 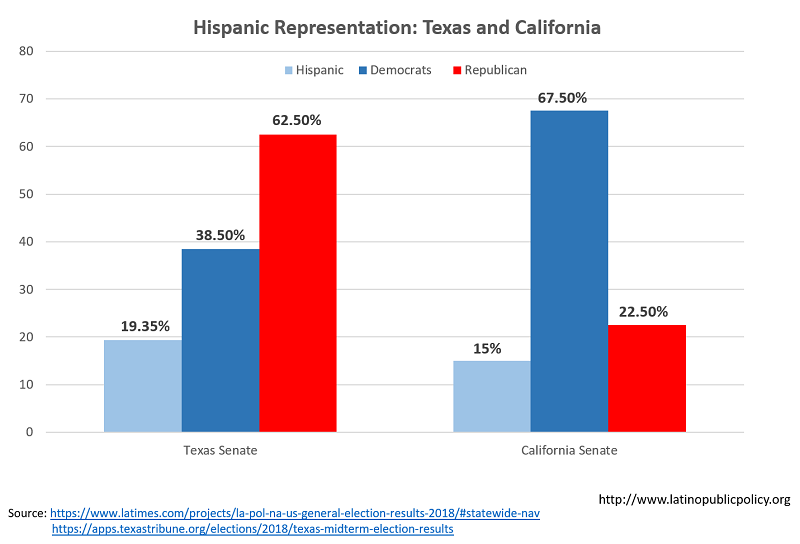 And though both Texas and California have similar demographics where about 40% of the populations are Hispanic, there is a stronger Hispanic Democrat presence in the Texas Senate than in the California Senate. As a result, claims that Hispanics in Texas will tend to vote more Republican than Democrat are false, and Hispanic Representation if both the Texas and California legislature proves that. 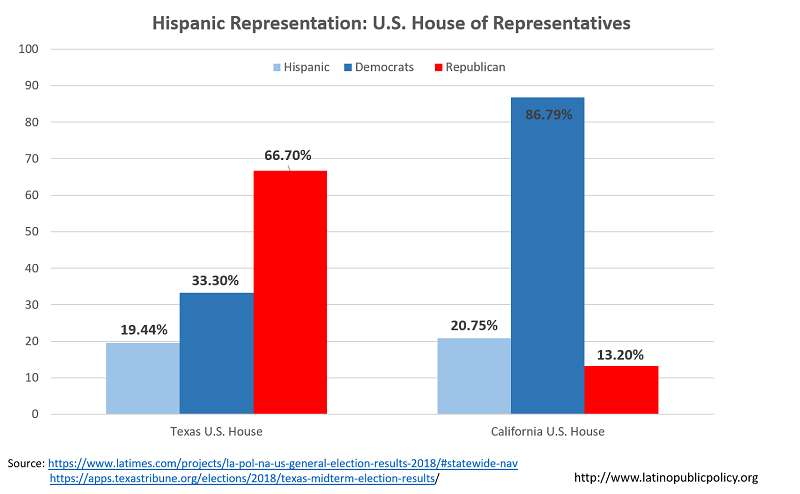 The chart above shows that there is a stronger Hispanic Democrat presence in the Texas House at 25.33% (the still need to add the new members who won in special elections) while in California it is 27.50%. It turns out, among Hispanics, Hispanic Democrats in Texas have almost the same representation than their cousins in California. As a result, while there may be a slight cultural variation between Democrats from Texan and Democrats from California, it appears that in Texas Hispanics are running and getting elected as Democrats than in California. CA 80 House seats: 27.50% of Hispanic Representation in the Assembly, 95% Democrat. There are 22 Hispanic members in the California Legislature, only one is “Republican,”Melisa Melendez but her real name Melissa Ann Schneider. TX 150 House seats: 25.33 % Hispanic Representation, 37 Democrats, 1 Republican. Of the 38 Hispanics in the Texas House, “Republican” JM Lozano is only Republican, but he switched from Democrat to Republican after Republicans in the Texas Legislature redrew his district. It is not clear what killed the “Hispanic Republican” brand, I’m not sure if it was Trump-ism or Cruz-ism or the tea party, but where six years ago there were 5-6 Hispanic Republicans, now there is only one. Texas and California Senate Seats. 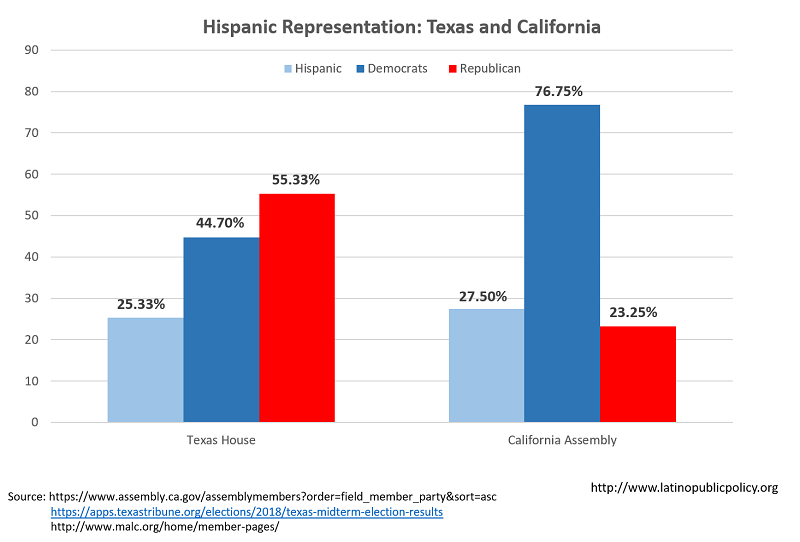 The Texas and California Senates have almost identical Hispanic Representation. TX 31 Senate seats. 19.35% Hispanic Representation, 5 Democrats and 1 Republican seat won by Pete Flores in especial election five months ago totaling 6 Hispanics. There are 19 Republicans and 12 Democrats. And Even if you didn’t count Pete Flores, Hispanic Representation in the Texas Senate would still be higher at 16.12% than in Californian at 15%. CA 40 Senate seats: 15% Hispanic Representation, 28 Democrats (6 Hispanics, all Democrats), 10 Republicans. 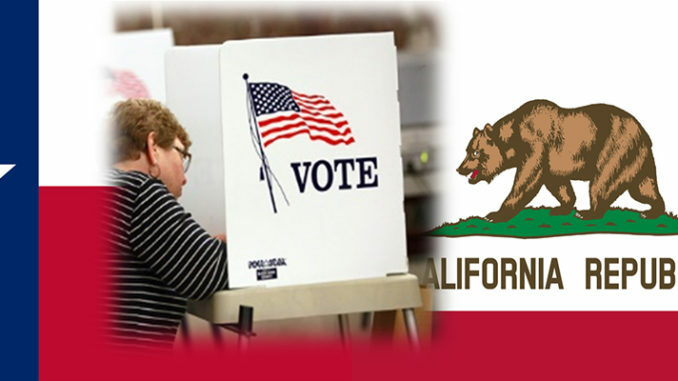 California 53 seats: 20.75 % of Representation ( all represented by Democrats), 46 Democrats ( 11 Hispanics), 7 Republicans. If you were not to take into consideration Pete Flores, who won in special election in SD-19, a Democratic-friendly Texas Senate district where state Sen. Carlos Uresti, D-San Antonio, resigned earlier this year after 11 felony convictions and JM Lozano, the only Republican left in the Texas House, who switched from Democrat to Republican after Republicans in the Texas Legislature redrew the district, Hispanic Republican Representation would be zero. I grew a in state that passed Prop 187 in 1994. And at the time, many were arguing why California was pushing this anti-immigration Hispanics laws while Texas remained a pro-Hispanic immigrant state, because, 1 Republicans in Texas were very pro-Hispanic, and the then Governor of Texas George W. Bush was also pro-Mexico. The other argument was that, unlike Hispanics in California that had been pushed into the economic and political peripheries, Mexican-Americans in Texas had been incorporated into power structure – the political and business class. And Thus, Mexican-Americans in the Texas didn’t feel antagonize by Republican Party apparatus. And that was the argument that for a long time many political “pundits” used as the foundation to fervently suggest Hispanics in Texas, who were middle-class pro-business and traditional culturally “conservative,” would inevitably be inclined to vote Republicans. However, many factors have change from those old assumptions in the Republican Party. And, even if Hispanics in Texas are cultural conservative, pro-family, and pro-business, they are not becoming Republican.